Come and Relax in this Beautiful Home! The home has been upgraded with laminate wooden floors in all bedrooms so great for allergy sufferers! This house has everything you could wish for - 2 large master suites with their own bathrooms and two twin bedrooms that share a bathroom so great for 2 families or multiple generations! There is a large screen TV in the living room and free WiFi so you can keep in touch with the folks back home! Theres also a games room in the garage to keep everyone happy! The community is Fantastic with a guard gated entrance so excellent security and amenities abound, Go relax in the heated extra large pool or watch a movie in the mini theater. And the adults can relax at the tiki bar and not worry about driving! 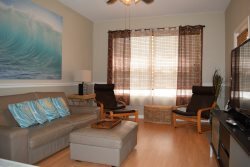 This is a great place for all the family and just 3 miles to Disney and plenty of restaurants and stores! Excellent community amenities including heated Olympic sized pool, tennis, mini movie theater, tiki bar and convenience store!